It's getting harder to find a Reputable Carpet Dealer these days! Carpet Scams are common and homeowners need to be very cautious about what they buy and who they buy from. Most carpet information I read on the internet is either inaccurate or deceptive and I don't put any value into online Consumer Reviews. They are easy to fake, impossible to verify and often purposely written to damage the good reputation of others. I know the carpet business inside and out! That's why I've created my own special hand-picked list of locally-owned Carpet Dealers who provide Free Estimates, Fair Prices, Knowledgeable Staff, Honest Measuring and Qualified Installers. Folks, it doesn't get any better than that! I choose each one of my Preferred Carpet Dealers very carefully using my own personal set of rules and requirements developed over many years. Only about one carpet dealer out of twenty has what it takes to earn my seal of approval. You may need to drive a little further to visit one of my Preferred Dealers but I truly believe it will be well worth the trip! I've been a consumer advocate since 1998, and as a 30-year veteran of the carpet business I know how difficult and confusing it can be to choose the right carpet and padding to meet your needs and goals! 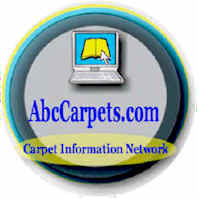 I invite you to read all my free carpet information to learn how to choose wisely, save time and money and avoid common carpet scams. 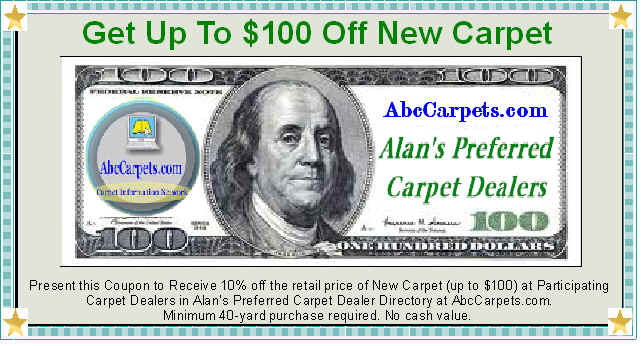 To get your absolute best deal on new carpet, I suggest you call and set up an appointment to visit their showroom and print out my free coupon to get up to $100 off, and please mention my name or website!